I’m a big fan of Yojimbo and have been using this tip to sync Yojimbo using Dropbox — except that I never had two Macs using Yojimbo before, so for me this was mostly just a backup solution. Now that I have two Macs I need to make sure that Yojimbo closes on one before I use it on another. KM closes Yojimbo for me Monday through Friday. 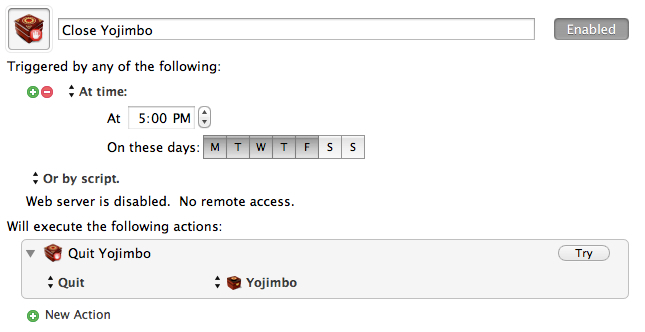 On my Mac at home I set it to close Yojimbo at 8a M-F.